Skull of Pachycephalosaurus at the Denver Museum of Nature & Science. Photo © 1996 Pamela J.W. Gore, Georgia Perimeter College. 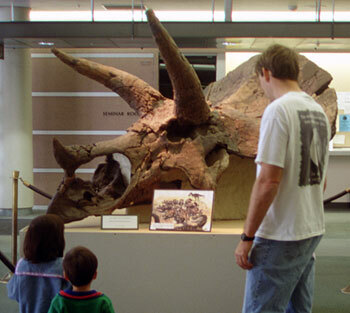 Visitors examine a Triceratops skull in the Valley Life Sciences Building, UC Berkeley campus. Photo by Dave Smith, © UC Museum of Paleontology. 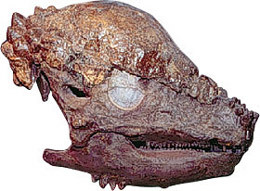 The Marginocephalia ("fringed heads") are a clade of extinct herbivorous dinosaurs that inherited a slight shelf or frill at the back of their skull from their common ancestor back in the Early/mid Cretaceous period. This "margin" was elaborated differently in the two main subgroups of the Marginocephalia. You are probably familiar with some of these taxa  they include the "bone-headed" pachycephalosaurs (above left) and the frilled Ceratopsians, such as the early Protoceratops and the famous Triceratops (at right). Marginocephalia is one of three major groups of the Ornithischia, or "bird-hipped" dinosaurs. They are closely related to the Ornithopoda and some scientists suggest that the origin of Marginocephalia may lie within that group, close to the Heterodontosauridae.